I have a little confession to make.. I'm a 26 year old who hates eating her veggies! No seriously, it's so embarrassing being a picky eater as an adult. Through the years I've been trying to expand my palate by either forcing myself to try a few bites of whatever is on my plate or "disguising" them in my meals. My boyfriend's mom has a huge garden and we get a weekly C.S.A. (community supported agriculture) delivery- so it's been slowly but surely helping me get out of my dietary comfort zone.Kyle & I have an ongoing joke that I can't go without some kind of meat in my dinner - so I've accepted this challenge and rounded up a few vegetarian recipes. 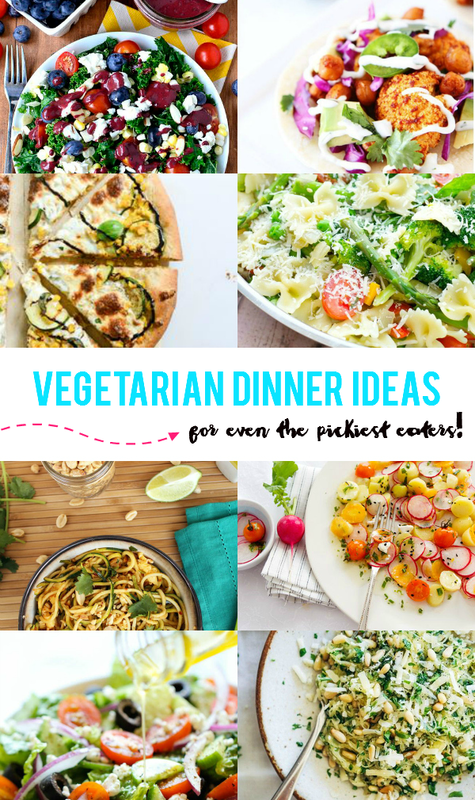 These dinner ideas all look super delicious, flavorful & fresh, even for picky, vegetable-despising eaters like me! I'm feeling totally inspired and ready to incorporate some more veggies into my meals! If you have a favorite dish for picky eaters- be sure to leave me a comment or tweet me a link! P.S. Looking for more healthy recipe inspiration? Check out my "healthy is happy" Pinterest board!